In November 2016, Shuki and Tori Levy traveled to Munster, Germany with a delegation from Israel and Canada. Shuki Levy’s musical Imagine This made its German debut in Munster with the Freies Musical Ensemble Münster. Set in Warsaw, Poland during World War II, the show is a musical drama about the power of resistance. A family of Jewish actors stage a play about the ancient siege at Masada to inspire hope within the walls of the Warsaw Ghetto community. This musical is helping to keep the historical story of Masada alive, while sparking renewed interest in the mountain and the Masada Museum. The declaration “Masada Shall Not Fall Again” has come to symbolize the will and strength of the Jewish people against those who seek to destroy them. “Imagine This” gives audiences an intimate look at the reality of the Holocaust, keeping the memory of this atrocity alive in humanity’s collective consciousness. The story is a moving and intimate portrait of a creative, loving family struggling to make sense of their desperate situation. By juxtaposing the ancient history of Masada with the situation in World War II Warsaw, audiences are given context for the ongoing persecution of the Jewish people, a sad reality that stretches back thousands of years. The resounding message that rises out of the story is powerful in its simplicity – never again. The Münster production gave audiences hope that even the deepest wounds can heal through the power of art. This all-volunteer ensemble of 100 performers–singers, actors, orchestra–offered a heartfelt telling of a very difficult story. 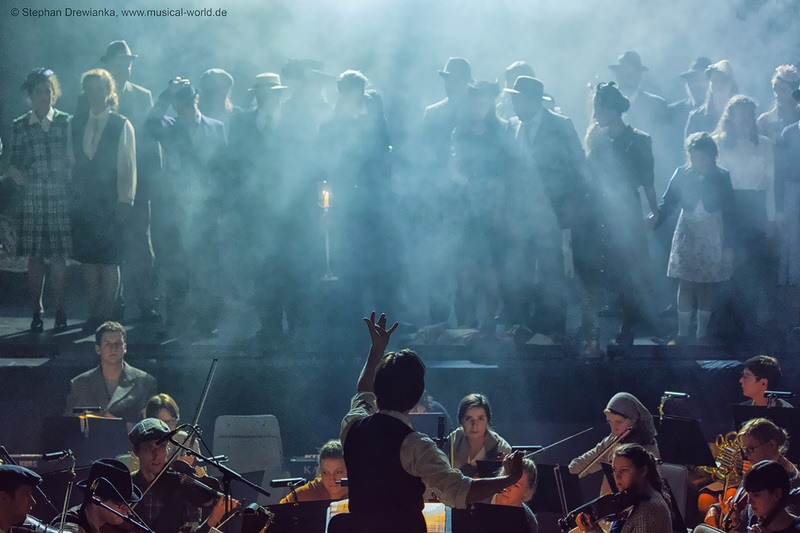 For a German cast and crew to undertake the massive effort of producing this musical is challenging, to say the least. They worked for over a year on the production, did intensive research into the history, and asked themselves the difficult questions– why? How could this happen? And most importantly, how do we prevent it from ever happening again? Many involved in the production had to come to terms with their own family ties to the historical Nazi regime (grandparents and great grandparents); the cast was often in tears during rehearsals as they faced the reality of the Holocaust. In the words of one cast member, “performing in this show made something that felt so distant into something that is very real.” German press was on hand to interview Shuki and the German creative team. A historical art gallery accompanied the performance to educate the public about the Masada story as well as the atrocities of the Holocaust. It was a deeply moving and educational evening of performance art. The Shuki and Tori Levy Foundation gives thanks to our warm and gracious hosts, directors Ingo Budweg and Canan Toksoy, Henrike Schelling, Carsten Jaehner, and the entire cast and crew. We would also like to extend our thanks to our Israeli and Canadian delegations– General Manager of Masada, Eitan Campbell; a representative from Israel’s National Parks Authority, Issac Grossman; Yigal Amedi, former Deputy Mayor of Jerusalem and current head of Israeli Arts and Culture; Yigal Molad Hayo of the Jerusalem Film Festival; and Rami Kleinman and Murray Palay from the Canadian Friends of the Hebrew University. We are forever changed by this experience. Gallery and press clippings from this event can be seen below.